Boolean: This type can only hold one of two pieces of information stored as a single bit of data (0 or 1). With AppleScript you will see them as holding a true or false value. AppleScript will evaluate the expression “3 is greater than 4” and return a value of false. So in that example, x is false. You will quickly learn the value of Boolean and find it as hard to write a script without it as it to write a sentence with no “e”. Date: Unlike what its name would suggest the date type is really speaking of a specific TIME and DATE. --> date "Monday, June 11, 2007 4:44:07 PM"
--> date "Monday, February 5, 2007 12:00:00 AM"
Note: Assigning year values only using 2 digits. The behaviour will differ depending on when you write your script. A) If you write your script at the end of a century (xx91-xx99), AppleScript will deem years 11 to 99 to be in the current century, years 00 to 10 will be deem to be in the next century. B) If you write your script in the middle of a century (xx11-xx90), AppleScript will deem years 00 to 99 to be in the current century. C) If you write your script at the beginning of a century (xx00-xx10), AppleScript will deem years 00 to 90 to be in the current century, years 91 to 99 will be deem to be in the last century. You will find out later that you can have AppleScript compile script at runtime; this can complicate things quite a bit when using dates. Better be safe than sorry and always use 4 digits. day: The integer (1-31) specifying the day of the month. weekday: One of the following 7 constants Monday or Mon, Tuesday or Tue, Wednesday or Wed, Thursday or Thu, Friday or Fri, Saturday or Sat, Sunday or Sun. month: One of the following 12 constants January or Jan, February or Feb, March or Mar, April or Apr, May, June or Jun, July or Jul, August or Aug, September or Sep, October or Oct, November or Nov, December or Dec.
year: The integral value of the year. Ex. : 2007.
time: The integral value of the amount of seconds that elapsed since 12 AM (Midnight) of the evaluated date object. date string: The string defining the “date” portion of the evaluated date object; for example, "Saturday, June 09, 2007". time string: The string defining the “time” portion of the evaluated date object; for example, "4:37:21 PM". set aDate to date "Monday, June 11, 2007 12:00:00 AM"
set bDate to date "Thursday, June 11, 1992 12:00:00 AM"
note: There are no constant for either Months or Years as their value (in seconds) vary from one to the next. As you can see, a little more of 15 years span between these two dates. this is du to the fact that (365*days) does not take leap years into consideration. Integer: Number, positive or negative that does not contains a fractional part. Ex. –1000, 2, 23400. Real: Number, positive or negative that can contain fractional part. Ex. –-24.5, 75.234, 3.14159265359. String (or Text): A String is an ordered series of characters bound together by quotation marks (“”). Note: A text and a string object are equivalent but the class of a text or a string will always be a string. set aString to "This is a String"
In the course of your scripting life, you will find yourself wanting for a certain variable to a similar value but in a different data type. For instance the string "2" and the integer 2 while similar will not support the same commands. The use of the 'as" command: You have probably seen my use of this technique in the past. The "as" command makes YOU the boss. The other technique is transparent. In some case, when AppleScript expect a certain data type and is presented with an other, it will try to coerce it silently to the desired data type. Before you think you are out of the woods and that coercion will solve all your problems, I must tell you that not all data type can be coerced to every other. 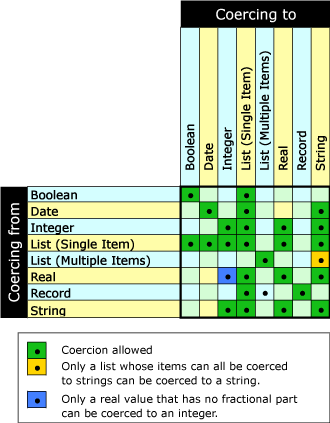 The table on the right outlines the coercion capabilities of the most commonly used data types. Of course, the actual value of the data type you wish to coerce plays a big role in the process. For instance, the preceding table states that a string can be coerce into an integer but you would be hard pressed trying to get an integer out of the word "house". —> Can't make "Two" into type integer. I realized I forgot to include the "coercion" information. I rectified the omission.